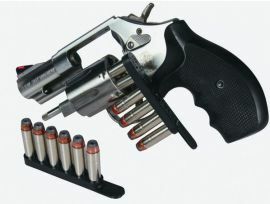 Bianchi Revolver Speed Strips Mod 508 44spl / 44mag - Bianchi® Speed Strips™ are a compact loading device for revolvers. Made from a flexible urethane material, these strips securely hold 6 rounds of revolver ammunition and conveniently load two rounds at a time. Speed Strips fit in most single mag/knife pouches and in a trouser or shirt pocket. A perfect slim back up for revolvers. Developed by John Bianchi more than 50 years ago, Speed Strips are offered in two sizes for .38/.357 and .44/.45 caliber rounds. They come with 2 strips to a package.